Congratulations! You’ve Won An Xbox! Chances are you’ve seen this message either as the subject line of an email or as a pop-up when you visit a site. My son was pretty excited when he saw it pop up the other day. No son, you didn’t win an Xbox. Do NOT click the OK button. But, isn’t there a chance? No. No one is going to give you an Xbox. But, what if you did win? Do you know anyone who’s ever won? I do. When the legend becomes the fact, print the legend. How do you know when to believe the offer or not? The guy who won the XBox entered a contest. He knew that many online contests are scams. This particular contest was sponsered by Microsoft. It was a few years ago and Microsoft was launching Office Online. Signing up for Office Online automatically entered you in the contest. He was an Office user anyway, so the contest was an incentive to do something he was already interested in doing. Congratulations. You’ve won an XBox! He was naturally suspicious. He checked the senders address and it was not a Microsoft address. In fact, he didn’t recognize the domain name at all. So far, not looking good. The domain name belonged to a sweepstakes company. It was hard to tell if they were legitimate sweepstakes or not. But, he had entered that contest months ago. So, there was a chance it could be legit. Plugging the name of the sender’s domain and the word Microsoft into Google came up with a hit. The sweepstakes company had signed a deal with Microsoft. But, there was no mention of any specific campaigns. Still, it was starting to look like maybe this might be legit. Or, the company was really good at phishing. Next step was to click on the link in the mail. Sure, and then you can pull my finger. But, still. . .he held his breath. . .closed one eye and carefully moved his mouse. . .CLICK. At this point, he still wasn’t convinced. He scanned the form for anything that might ask for a credit card number “For minor shipping and handling charges.” Nope. Not on the first page. All they wanted was shipping information and his name. They were probably going to let him get several pages in and then spring it on him. Cautiously he filled in the required fields using a PO Box that he had. He still wasn’t trusting enough to give them his home address. The next page asked him to verify his information. The final page showed a blance due of $0.00. And no request for a credit card. Could it be? Might it actually be legit? He closed his browser and still refused to believe that someone was going to send him a free XBox 360. But, as far as he could tell, he hadn’t offered any information that could be used to steal his identity. Another email showed up a few days later. He drove to the post office. Sure enough there was a slip in his box. Almost in a daze he took the slip to the counter. Do you have a package for me? Sure do. Here you go. Sign for it right here. It was the right size for an XBox. It was the right weight. 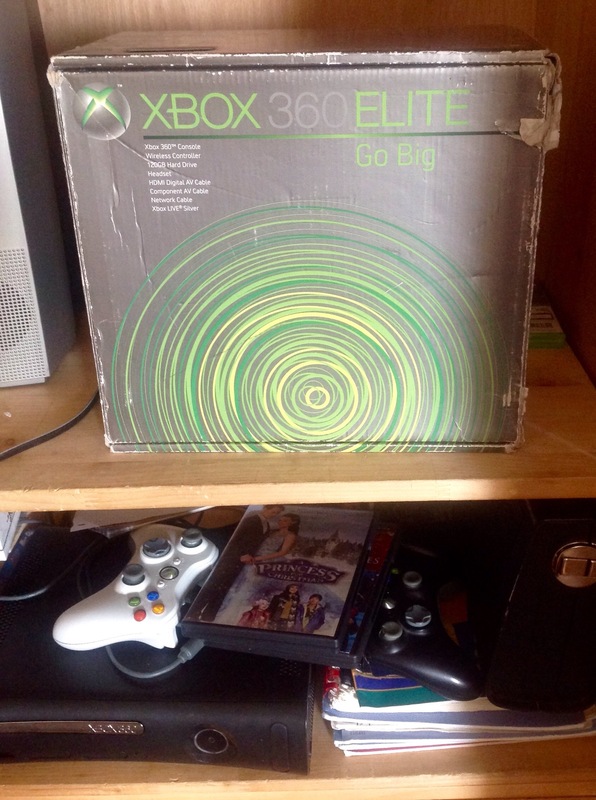 Opening the cardboard shipping box, he was greeted by the distinctive green and gray colors of the XBox. A brand new XBox 360 was his. Well, do you know anyone who ever won an XBox online, Dad? Just one, son. Just one. Years later he still has the box. « What’s Inside Of The Outside?